Talsa has recently changed its logo. The family company started in 1900 and, since then, the industrial enterprise has been true to its image, always adapting to new times and changing its typography but always remaining faithful to its beginnings. For many reasons changes are needed, and Talsa has changed and modernized all its catalogs in order to project a more solid and simple image of its elements. The new logo may not represent a drastic change. A very commonly used element in the industry has been used: the star has been changed for the blades, and the typology is more modern. However, its stamp remains just as the fiery red that represents the passion Talsa puts in its business, a color also representative of the meat industry. Talsa is a company dedicated to the manufacturing of medium capacity machinery for the meat industry. Its mixers, stuffers, cutters, mincers and cookers are simple to the naked eye, manufactured in stainless steel, present the elegance of a job well done and a programming of all functions that exceed expectations. Both its economic and its professional line are studied for an easier handling, moving and use, they are designed for the strictly necessary and the aspects of cleanliness and safety are also taken into consideration. The new catalogs are already uploaded on the web for users to consult all technical characteristics of its products. Its expansion to the international market and the moment of technological transition we are living have been a good timing for these changes for an enterprise obsessed with always giving its best, on the best conditions, with quality and its customers always in mind. The company’s philosophy is the same and always present when producing the machinery and going hand in hand with technological developments that adapt to changing times. In Talsa they do what they think and they think hard of what they do. In order to show excellency it is necessary to be competent, that is, having competence. The adopted philosophy, its history, trajectory and commitment to quality values is what keeps a company on a visible spot and with expectations of expansion and renowned prestige. Expansion is like an oil stain that spreads the good but also the bad. If a bad practice can lead to ruin, a good management together with good products can also expand potentially. Always starting small and then advancing, the echo of creative, innovative and leading companies rests on a solid base built on years of hard work and experience. The development of a sales strategy is not a matter of days and it is reinforced by establishing strengths where there were once weaknesses. 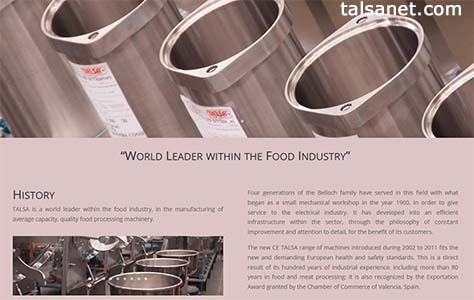 Talsa is a European company and example of international leadership in the making of machinery for the meat industry, its leading product being the medium capacity mixer. 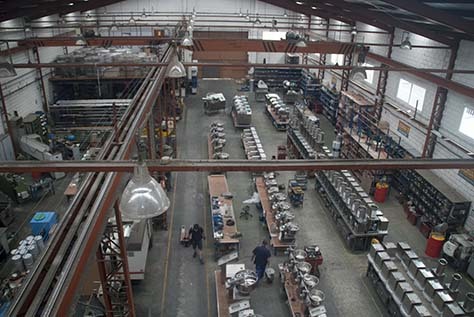 Its catalog offers filler/stuffers, mincers/grinders, cutters/choppers and cookers/kettles only to distributors that endorse the company’s brand during the sales process and maintenance by additionally offering a permanent technical assistance service. The American market could not resist and corroborates Talsa’s leadership in the international market. Talsa has been producing and exporting its machinery mostly slowly, with the soundness gained from 100 years industrial experience. 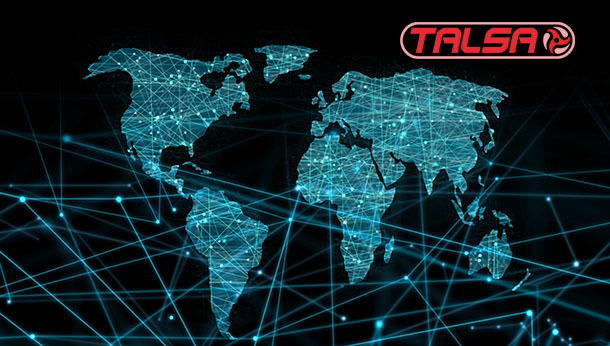 Exporting requires meeting very strict quality control checks, and so, Talsa trusts all verification agencies and advice on quality control by the European Community. And so, it consolidates in the market as a company that sells machinery that will not need almost any spare parts in the future. All of these reasons make of Talsa a very competent company, with a well-defined course of action that differentiates it from the competition. As August approaches, cities become desert and the labor market is affected by the arrival of the summer holidays. Most companies face a reduced employee workforce during the holidays in July and August and others must double theirs, especially in the tourism sector. It is possible to feel the empty cities as the hot months approach, but something inside all companies stays connected to the real world: servers, computers, programs, the web, email services and WiFi. The latest was once considered the philosophers’ stone and has now become a common service in bars, restaurants, hotels, etc., allowing our companies and businesses to travel with us. Nathan Rosenberg, a well-respected authority in the innovation, science and technology fields, already told us in a visit to Spain years ago that it was necessary to change our direction and develop new products to be incorporated in industrials processes, and to invest in higher education in order to develop complex technologies. Now that we possess the common dissemination channels, all is left is to invest in the training and recruitment of this personnel so that Spanish enterprises become more competitive, and to invest in mathematical talents, engineers, computer scientist and telecommunications specialists. Talsa is a company that has been wise enough to invest in I+D+i and has trusted high-performing professionals. It has so become a very influential company at an international level not only for its machinery for the meat industry, but also for its network system that connects all its distributors to remain aware of any needs their clients may present, and an actual commitment 365 days a year. Talsa is a company that will make of Spain a competitive country. 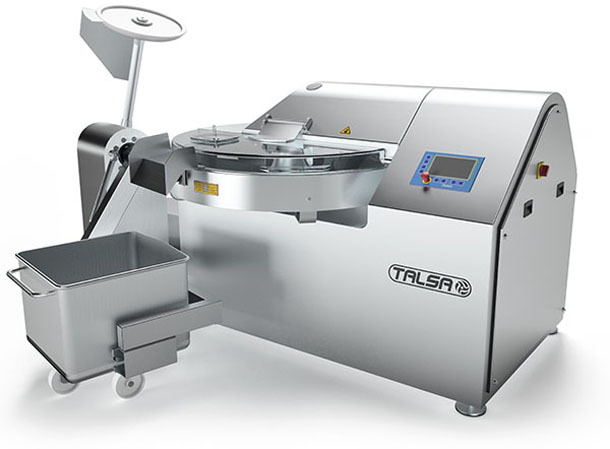 The Spanish company Talsa is the world leader in machinery manufacturing for the meat and meat products industry within the medium capacity segment, with high quality machines. Manufacturers from the machinery sector and meat industry technology developers are going to take advantage of the next edition of IFFA in Frankfurt, which will take place from May 7th to May 12th 2016, to promote themselves on the foreign market. As could not be otherwise, Talsa will participate at the IFFA Frankfurt 2016 Fair, stand 8.0 C55. Even though Talsa is already consolidated in the European market, the company is going to take advantage of this edition of the IFFA Frankfurt to strengthen its expansion in the North American market, in which it is beginning to have a strong presence. The projected expansion for the meat industry machinery sector is very optimistic, because the forecasts prepared by the FAO and the OECD for the next decade regarding meat products consumption anticipate an important growth. However, if we consider the uncertain economic growth in Europe, the need for expansion to other markets, like the North American market is evident as a way to ensure businesses growth. There is no doubt that exports are a way to invigorate businesses activity. Talsa is a clear example of this statement, because the largest part of its production is destined for export. Talsa is a very competitive company, due to the high quality of its products and the excellent post-sales service offered to its distributors all over the world. The developed countries, which are the principal targets of Talsa exports, have technological requirements aimed mainly to the increase of the machinery’s useful life, and, in that regard, Talsa is a benchmark. An example of a company with over 100 years antiquity and more than 80 years in the same sector, which thanks to innovation has known how to get ahead of its competitors, is undoubtedly Talsa, Talsabell, S.A.
Talsa is a manufacturer, a world leader, in machinery for the meat industry, industrial machinery for pork butchery, sausages and cured meats. Ongoing investment in research, development and innovation has made Talsa a recognised name at worldwide level in the manufacture of medium capacity machinery for the meat industry. Knowledge of the global meat industry market, based on ongoing study of same and their extensive experience. A great team of professionals leading the company, in both technological and commercial fields. Ongoing research work for the improvement of their industrial machinery, both in terms of optimizing their manufacturing processes, as well as the quality and performance of their products. Personalised, highly qualified customer service. After-sales service of the highest quality. An example of all this can be seen in their Website, produced in six different languages and which demonstrates Talsa’s interest in providing a personalised services to their clients, with full product information. The website has a private area specifically for their clients, where they can place orders and access other services both easily and expeditiously. 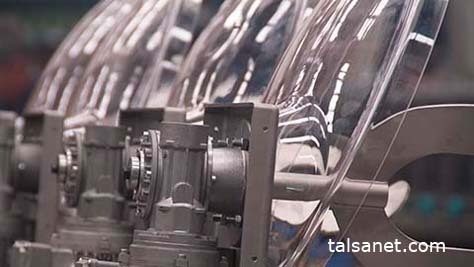 Becoming a global benchmark in the manufacture of machinery for the meat and sausage industry and industrial machinery for pork butchery and cured meats was the goal the management team at Talsa set themselves from the very beginning. All the machinery manufactured by Talsa complies with demanding European health and safety standards, having obtained recognition from the Chamber of Commerce of Valencia (Spain) with an Export Award.